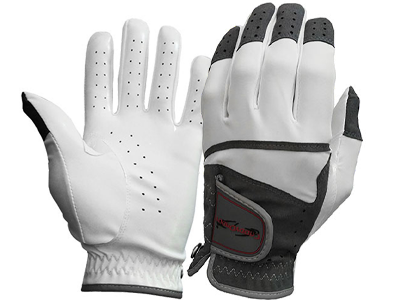 It probably seems self-evident but the purpose of wearing a golf glove is to help the outcome of our golf swings by providing a secure and comfortable grip on the grip. It’s the same principle as a wide receiver donning gloves to help him catch the football or your favorite homerun hitter at the plate. It was those two examples that Rod Dunlap and the people at CaddyDaddy Golf put together to come up with the Talon golf glove. Their investigations showed the construction of gloves used by players in other sports didn’t work for golf but the idea of making the glove tacky was a real winner. The Talon is made with what the company calls a “Tack-Fusion Palm” and after extended wear on both the course and range I can vouch for the fact it works. Living in Florida I found this new glove feels better when the humidity was high than some gloves do in the Arizona desert. The use of synthetics meant CaddyDaddy could build some other nice features into the Talon such as putting mesh in the right places to give a conforming fit and lots of perforations to help keep your hand cooler. And I particularly liked that it can be washed with the tackiness being the same as ever.